This is a real crisis both for the US capitalist class and for Trump. Every night CNN has over an hour raking Trump over the coals over this “Russia” issue. Much of the issue revolves around the claim that the Russian regime hacked into computers here involved in the election process and tried to influence the outcome. It wouldn’t at all surprise me if that is what happened. After all, the US government has done everything it can to get the results they want in other countries, so why wouldn’t the Russian government do the same? 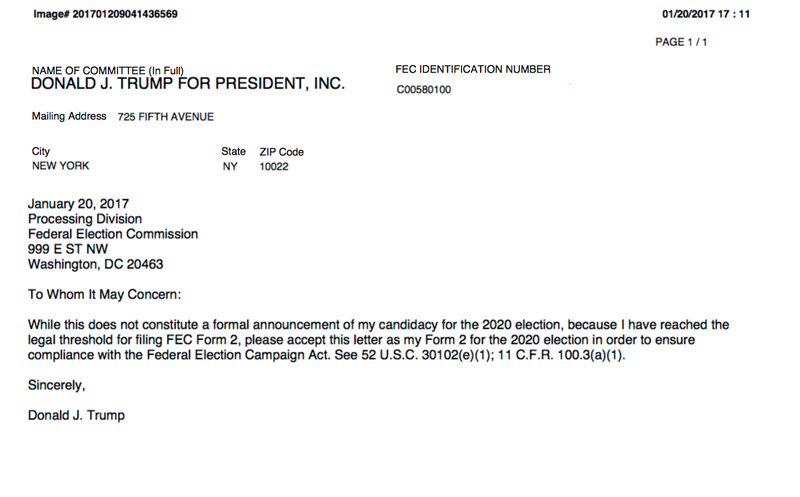 Evidently Trump has already filed for reelection. This is unprecedented at this stage of his presidency… but it allows him to start collecting bribes, known as campaign donations. revealed to exist. One of the latest is the secret meetings between Trump’s son-in-law, Kushner, and among other things some Russian banker. Kushner is an official “special advisor” to the president. In my opinion, he is Trump’s bag man. Beneath this, I think Trump is using his position to further enrich himself to an unheard of degree. Doing so has always been the “American Way”. In part, that’s what the talk about “special interests” is about — that different politicians are in the pocket of different particular capitalist interests and this makes it difficult for them to act in the fullest interests of the US capitalist class as a whole. Of course, when push comes to shove, they will band together, for instance in a war situation. 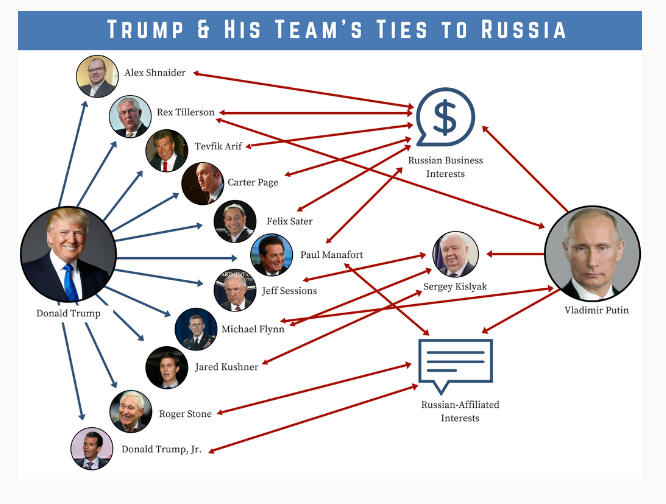 But in Trump’s case, push has come to shove, and he’s so deeply connected with Russian financiers and bankers that he cannot disentangle himself, even if he wanted to. But this idiotic, short sighted plunderer probably doesn’t even want to, even if it weren’t too late. That makes the mainstream of the US capitalist class very nervous that in a crisis with Russian capitalism he will not act in their interests. So CNN, and other major news media, are putting out the view that Trump might not be really representing “America” and “our” interests. What they really mean is the US capitalist class’s interests. This is too much for most people here. Already, Trump’s approval ratings are down below 40% (some surveys show as low as 35%). Normally, the “honeymoon” period would still be in effect and a president would have approval ratings well over 50%. His present ratings are below whatever Obama ever had. There is still a layer of Trumpsters who will support him no matter what. (As Trump said during the campaign, he could shoot somebody in the middle of 5th Avenue in NYC and still retain his support.) What this shows is that the majority in the US is still under the sway of the mainstream of the US capitalist class, as represented by the likes of CNN. That’s because the economic or world political crisis here is not that severe…. Yet. Some conspiracy theorists are claiming that the “deep state” – namely the CIA – is hitting back because it wants a war with Russia. Behind this is the claim that this is so because war is profitable. Incredibly, some who claim to be Marxists echo this nonsense. Why would the military-industrial complex, of which the CIA is part, want to oust Trump for their own financial interests? Isn’t he proposing a $54 billion increase in military funding? No, politics is not that simple. In reality, the “deep state” is simply part of the capitalist government, which is much more than just the elected officials; it entails all wings of the government bureaucracy. And now one wing of that bureaucracy is keeping in check a president who is not fully beholden to the mainstream of the US capitalist class. And if that president doesn’t fall into line, he will be removed by one means or another. Enemy of my Enemy = My Friend? But make no mistake about one thing: Just because the mainstream of the US capitalist class has major conflicts with their counterparts in Russia and the representative of Russian capitalism – Putin – it is a huge mistake to think that workers in the US or anywhere else should side with Putin. Just ask the Russian working class. The enemy of my enemy is not necessarily my friend. Meanwhile, Trump is totally gutting any environmental protections, just as was totally predictable. But who cares? At least we’ve got some good political theater going here.